Did you see the article in Dwell magazine about Tim Wright’s fabulous little prefab home? The grandson of Frank Lloyd Wright is living in a small home in the hills of Wisconsin’s Driftless Area, not far from Taliesin in Spring Green. (This is actually a second home for Wright and his wife. Their main residence is in Boston.) 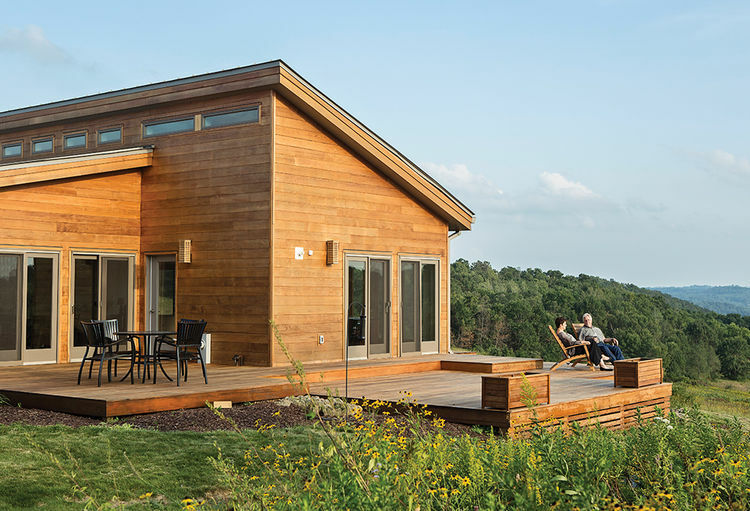 For their home in Wisconsin, Wright chose a prefab model designed by Blu Homes which was manufactured in San Francisco and then transported to Wisconsin. Our American System Built home was one of Frank Lloyd Wright’s early attempts at affordable prefab homes, which might have been more popular were it not for poor timing (World War 1 was right around the corner). While the ASB homes were not manufactured offsite like today’s prefab homes, the components were all cut, labeled and then shipped to their final destination to be constructed. Rumor has it that the components may have made their way from Milwaukee to Iowa via railroad. It’s interesting to know that Wright’s grandson is still honoring his grandfather’s notion of affordable prefab housing. This entry was posted in architecture, Frank Lloyd Wright on 06/02/2015 by Jason.